When are you guys getting your girls' hair cut? J's isn't very long, but it's kind of scraggly. It looks really cute when she lets me put it up, but her recent refusal to let me touch it has me wondering if maybe it's time? She looks like a wild child! I just did a month ago. She loved going to the salon. It actually made her hair thicken up a bit and become a bit more manageable. We just did a little trim. I trimmed the ends a couple months ago. I'll need to do it again soon. So much hair and grows so fast...just like her mama. Has my curls too. 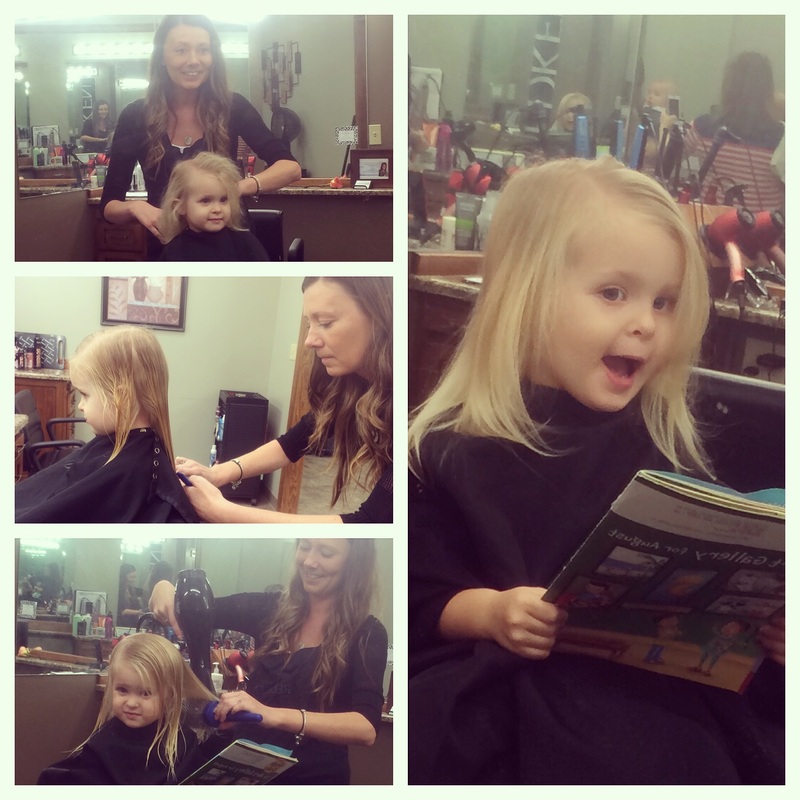 @excited30 - I wish I could say scissors have never been near her hair! We got a call from daycare that she had given herself a haircut not too long ago. It turned out that she cut a teeny tiny piece and you couldn't even tell, but it got me thinking about it! @nunzchucks - your Claire is so cute! Jane's hair is much thinner than that - like her mama's! @countrygrl5533 - you are much braver than I am! I don't think I'd ever be brave enough to cut her hair myself! @kaleb87 - I have the same fear. Her hair was so curly for a while, but now it's really just curly at the ends. @cmdouglas -- My mom had a salon on our front porch when I was a kid and used to teach beauty school. I don't have the knowledge that she does (obviously) but as I was homeschooled, I was around when she was working. I learned a fair amount. Hair doesn't scare me. We're still long and curly and driving everyone nuts .. the lil guy has been called a girl so many times lately despite being dressed VERY Male. I'm talking Doc martens, Black Jeans, Black shirts and Leather jackets ...and they still say how cute her hair is LOL.